The average American driver has three to four accidents over the course of their lifetime (according to the Association for Safe International Road Travel); if you start driving at age 16, you’re likely to have had your first accident before the age of 34. In the vast majority of cases, having an auto accident is a question of when not if. Chances are, thankfully, that your first, second, and consecutive crashes won’t be deadly or cause significant personal injury to you or anyone else (though costly repairs are unfortunately a reality in many cases). But accidents, no matter how serious, can be scary and confusing. 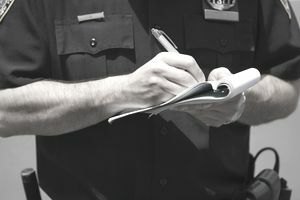 Knowing about how police reports work and whether or not to file one well before an accident happens is a good idea. If you've never been in an auto accident, good for you. It's certainly not something I would wish on anyone, but it is something that I think you should “look forward to.” Don't worry; it's not as strange as it sounds. Most drivers will likely be involved in at least one small accident in their lives, probably more than one. So it is the wise driver who is best prepared. That's all I mean by "looking forward” -- plan so that you’ll be prepared when the inevitable happens. Regarding the law, the more accurate question is: "When am I required to file an accident report with the police?" That's because all states have their own unique rules about when a report must be filed. For example, Massachusetts requires that an accident report is filed if someone was injured or if there was more than $1,000 in property damage. In Alabama, however, a report is necessary when an accident results in death, personal injury or more than $250 in damage to any one property owner. So it's a good idea to know specifics of the state you are operating in. Notwithstanding the legal requirements, the best advice is to file a police report regardless of the damages. I don't mean to be cynical, but the truth is that people can be a little shaken up and not thinking too clearly right after an accident. So it's no surprise that the facts surrounding an accident may be somewhat cloudy even just a day or two later. Which brings me to this: you may not think you need a police report when you are at an accident scene, but there's no way of telling until later on, and then it may be too late to avoid being sued for damage you may or may not have caused. If you call the police, they will be able to attest to the reality on the ground: who appears to be injured, what the extent of the damage to each vehicle and the surrounding landscape is, and who seems to be at fault. If the police aren’t involved, it will be your word against another driver’s word: which can come back to bite you. Regardless of whether or not you dial 911, you need to document everything at the scene of the crash. Take lots of photos -- of your vehicle, of their vehicle, of the surrounding area -- so that those pictures can be used if you find yourself being sued or questioned by a police officer. In most cases, you will not need a police report to file a claim with your insurer unless there is extensive damage that you’d like to be compensated for, or something unusual happens, such as a crime taking place or the other driver fleeing the scene. However, having a police report that you can provide to your adjuster will likely speed up the claims process. In most states, the police will not file a report for accidents occurring on private property. What is private property? Private property would include private residences. For instance, if your friend backs into your vehicle while in your driveway or if your teenage driver backs into your garage door. Maybe more surprising is the local grocery store parking lot is considered private property. That means it's up to you to get the information needed to properly file a car insurance claim. One of the first things the police dispatch will ask you is what is the location of the accident. If it is private property, most likely they will inform you the police will not come to file a report. Police reports are for accidents occurring on the road, backstreets, highways, city roads, and country roads. It may sound obvious to you, but you only need to file a police report if two or more parties were involved in an accident or if you damaged someone else’s property. If you run into a telephone pole and damage your bumper, that does not cause for calling the police -- just document the damage and move on. Is Your Police Report Complete?